Christmas Creations is an outdoor decorating company. 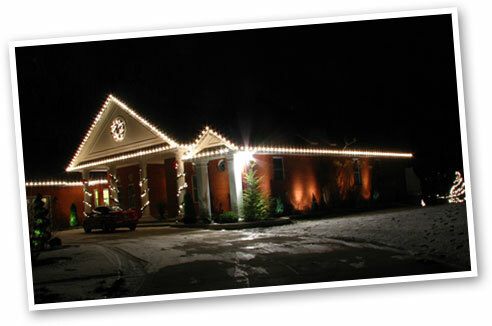 We provide Christmas and Holiday light installation services for commercial and residential properties. We own, maintain, and store all of our own materials in order to provide your home or business with a hassle-free holiday season! We believe it is important to change our business strategy to meet the needs of our existing customers and potential clients. Many citizens feel that the national economy has seen some improvement in recent years, and so we are pleased that this will offer the opportunity for local residents and small businesses to experience more of the past splendor and luxury to which they had been accustomed during other Christmas seasons. Make it magical this year! Give us a call to schedule your design installation! After more than a decade in operation, we look forward to servicing our current clients and to providing beautiful lighting for more new clients than ever before! This is not an “all or nothing” opportunity. And even though this is a luxury service, we can still work with your budget to help you receive a holiday look you will love. Our design manager urges each client to make the roof line a top priority, since it produces the most eye-catching view. But adding lights to your landscaping also takes your design to a whole new level of spectacular! We look forward to working with you this season!